Hello Doodlebugs! 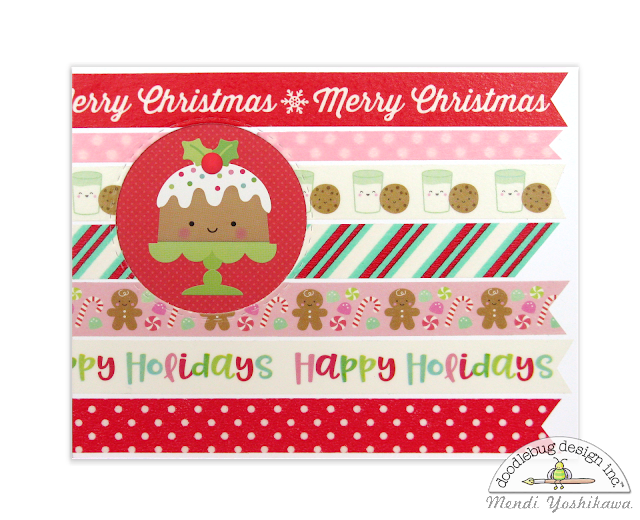 It's Mendi here today with a trio of cards showcasing some fun ways to incorporate washi tape into your holiday cardmaking! For my first card, I quickly covered the front of a 5.5" x 4.25" card with the darling tapes from the Milk & Cookies collection, as well as a few fun basic polka-dots. After my card front was covered, I die-cut a circle from the front and inserted a cute little sticker in the open space. This card design is perfect for mass producing and is great for mailing because it's very flat. For my second card, I wanted to show off the translucent qualities of the washi tape so I adhered the adorable milk & cookies tape to a piece of clear acetate, alternating with the basic thin gingham and polka-dot washi tapes. I left a little space between the tapes to see through to the inside of the card and then cut a 4x4 inch window from the center of my card front. I then sandwiched the clear acetate between my front card panel and my card base, covering the seam with the scalloped aqua frame. 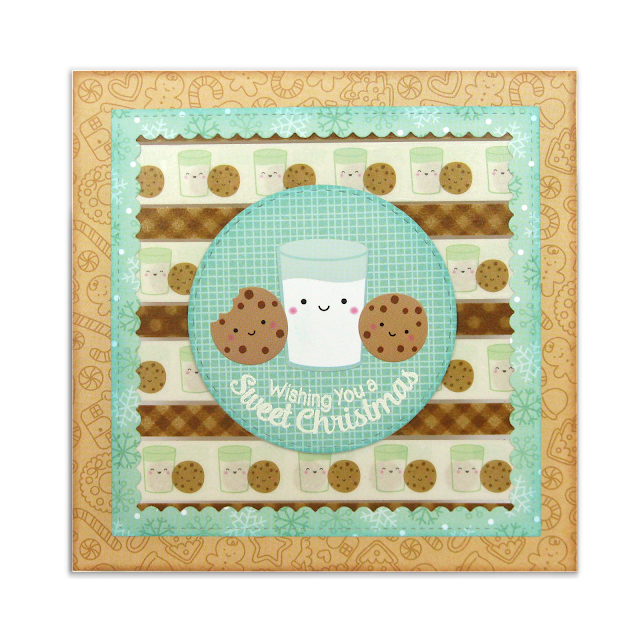 To finish my card I heat embossed a stamped sentiment onto a die-cut circle and added the darling milk and cookie stickers from the icon sticker sheet. My last card of the day uses the super cute gingerbread washi tape with the same techniques utilized on my second card. When my frames were in place, I embellished the outside with the adorable little gingerbread stickers popped up with foam tape and a sentiment from the This & That sticker sheet. I thought the heart sprinkles were a great finishing touch to tie the pink colors in with the rest of my card. These are just adorable. Awesome cards!! What a fun,fun, fun idea!! I never have enough washi ideas!!! Thanks Mendi!! love these ideas! 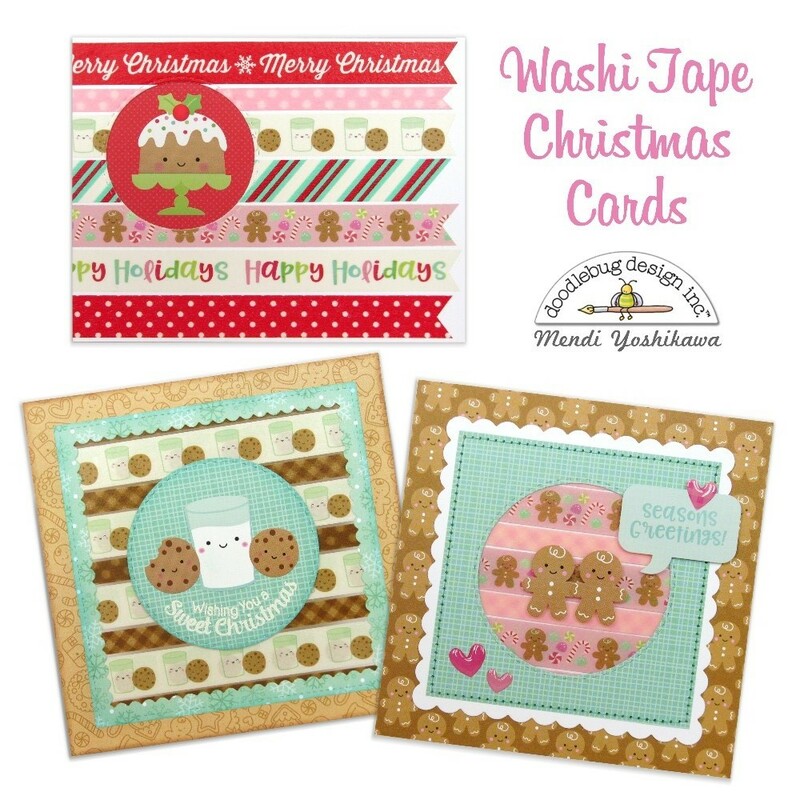 i have so much washi tape, this inspires me to use them for card making. Thi is such a fun challenge and the results are super cute !